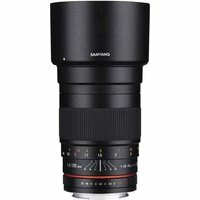 The Samyang 135mm f2 ED UMC lens is a manual focus prime that allows for delicate, artistic photography. The lens' Ultra Multi Coating (UMC) technology optimises light transmission and minimises flare and ghosting. This bright f2 telephoto prime expresses vibrant colour and soft out-focusing area which makes it the best lens to shoot portrait, night scenery, wild-life and journalism photography. Compatible with Sony's full-frame a7 II, a7R II and a7S II compact system cameras.